While Bee Gees’ 1st would be their international debut, The Bee Gees Sing & Play 14 Barry Gibb Songs is actually their first album, recorded in Australia before the harmonising trio relocated to London. Released in 1965, the album is largely made up of singles that had been released in the years preceding this release. The success of this album was lacklustre and the Bee Gees would only really receive the recognition they deserved, in Australia, at a later stage in their career. Nevertheless, if one was to base their likes and dislikes on album sales, they would miss out on the richness of back catalogues. The Bee Gees’ back catalogue is full of hidden gems, especially considering many readers would only be familiar with their chart-topping, re-invented, disco-styled music. Nevertheless, these early recordings are beautiful. You’ll hear the influence and similarities to The Beatles, Bob Dylan, and The Hollies amongst others. That isn’t to say that the Bee Gees lacked originality, for their harmonious interweaving vocals were as legendary then as they would be throughout the band's career. Out of the 14 songs, five were new recordings with the lead song, I Was A Lover, A Leader Of Men being released as a single. While the single failed to gain any traction in the charts, the song is exceptional with a sonic signature that would be replicated, albeit with more success, on future albums. I Don't Think It's Funny is a lovely acoustic-based song with Robin Gibb on lead vocals. His gritty, yet smooth, vocal delivery is absolutely captivating. How Love Was True is another enjoyable track that is somewhat reminiscent, in my mind, of the harmonious Lennon/McCartney years. To Be Or Not To Be is definitely inspired by early Beatles recordings. Think Please, Please Me/With The Beatles era. It isn't a bad tune but arguably doesn't suit the Bee Gees. Timber is short and to the point. It is certainly reminiscent of the late 50s and early 60s. Timber was recorded and released as a single in 1963 and with a runtime of less than two minutes, one can only wonder how tedious playing that 45 would have been. Claustrophobia is a great 60s pop tune. I love it! Could It Be I’m In Love With You has an addictive rhythm that will have you toe tapping and head bopping uncontrollably. And The Children Laughing is a song that reminds me of The Seekers. Unfortunately, it isn't to my taste and while it’s adequate, it’s a B-side. Wine And Women would be the first Bee Gees single to achieve chart success, no doubt due to the band, their friends, and dedicated fans buying as many copies as possible in the hope radio disc jockeys would notice them. I don't know about you, dear reader, but surely they could have come up with a better song to release as a single. Okay, so it isn't that bad, but it certainly isn't the most compelling song. Don't Say Goodbye is another B-side. Although, the choral harmonies are very nice. Peace Of Mind is a great song with a killer guitar solo. Sensational! Take Hold Of That Star is too slow for the Bee Gees. That said, it is a lovely song, I just don't feel it suits them. You Wouldn't Know is a great pop/rock tune with an incredible rhythm. Follow The Wind is a fantastic song to conclude the album with and ensures that I’ll to listen to the album again and stay within the Bee Gees pre-disco era catalogue. Overall, The Bee Gees Sing & Play 14 Barry Gibb Songs is a superb collection of their early recordings. While it doesn't necessarily stand out, it certainly shows just how talented these three brothers were at such a young age. Sonically, one must remember the era these songs were recorded in. However, the 2012 remaster, from TIDAL Hi-Fi, which this review is based upon, is likely the best quality these songs will ever be presented in. It doesn't happen often, but this remaster is lovely and worthy of inclusion in any Bee Gees collection. The album cover is also exquisite. Yes, it’s reminiscent of the era and the style of music, but it also just works. I’d love to see this re-issued on vinyl. It would be a pre-order for sure! Until then, I will have to be satisfied with the edition available in CD-quality on TIDAL Hi-Fi as a CD release is also unavailable. Nevertheless, if you would like to own a copy of The Bee Gees Sing & Play 14 Barry Gibb Songs, the album is available on the TIDAL Store (16/44.1kHz FLAC) and iTunes. If you prefer streaming, you can also listen to The Bee Gees Sing & Play 14 Barry Gibb Songs on Spotify and Apple Music. Posthumous album releases can either add an exceptional balance to the catalogue of an artist, or they can be disastrous by trying to capitalise on the fame of an artist. Thankfully, 50 St Catherine’s Drive brings a beautiful balance to one of the most talented musicians to have walked the earth. I have been a fan of the Bee Gees since I was a child, but only recently have I started to look deeper into the individual catalogues of the Gibb brothers. To be honest, I don’t know why I hadn’t explored their music in more depth, as their talents are certainly not restricted to the Bee Gees brand. This is perhaps where streaming services, such as TIDAL Hi-Fi, are essential to music lovers as they allow one to sample an album, prior to purchase. Yes, I will be buying this album on CD, despite having the exact same quality available on TIDAL Hi-Fi. One key reason that confirmed this process, in my mind, was when we moved home a couple of months ago. It took three weeks until a service technician was able to come out to the home and transfer our Internet connection. During that time, I simply wasn’t able to use TIDAL Hi-Fi and had to turn to my own collection of music for entertainment. Plus, I personally feel more connected to the music if I can hold a CD case while enjoying the album. You will note that I have said CD. That is because this album was sadly not released on vinyl. In-fact, the entire Bee Gees catalogue needs to be reissued on vinyl, but that’s a story for another day. 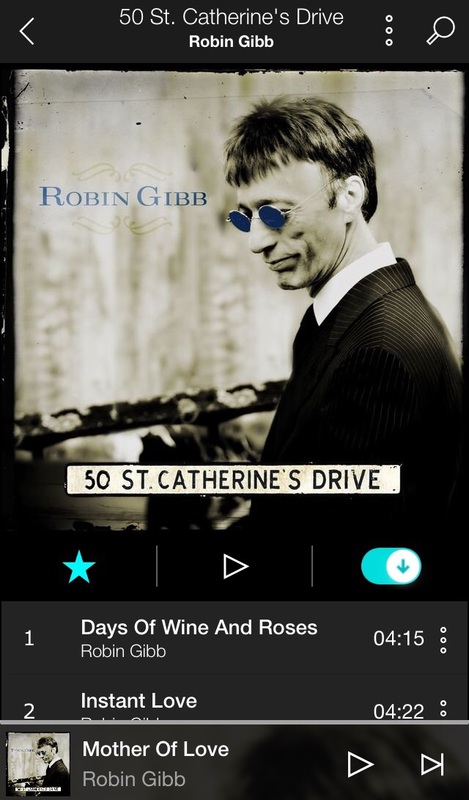 50 St. Catherine’s Drive is said to be the last album of unreleased recordings by Robin Gibb. I couldn’t be happier with how his legacy has been presented and I have had the album on heavy rotation, having listened to it completely at least a dozen times. Upon each listen I appreciate the album further as I marvel at the unique vocal delivery that only Robin Gibb was able to bring to music. Honestly, this is an album that you can easily play all day without getting fatigued. I even thoroughly enjoyed it on my morning walk. When music can remove the monotony of walking from my consciousness, I know something special is occurring. Days Of Wine And Roses opens with a beautiful intermingling of piano and vocals. You instantly know what to expect from the rest of the album. It feels fresh, while also being reminiscent of Robin's work in the Bee Gees. Instant Love is an instant love for this fan. I adore this song. The musical arrangement is exceptional. There is an electronic sound in the background that is subtile, by really appeals to me. As I’m not a musician, I couldn’t tell you what this sampled sound is called, but if anyone can elaborate, I would love to hear from you. Alan Freeman Days was written in tribute for Australian DJ Alan Freeman. It is a lovely song, but I feel a little too upbeat for a tribute song. That said, it was obviously recorded with artistic license so, one must respect the approach that Robin took with this song. He also adds a single lyric in memory of his late brother Maurice Gibb. It is a lovely addition and well worth a listen. Wherever You Go is rhythmically perfect. It is a toe tapper and Robin’s vocal delivery is perfect on this song. Without a doubt, this is one of my favourite songs from the album. I Am The World (New Version) is a re-recording of the Bee Gees version that first appeared as a B-Side on their 1966 release Spicks And Specks. From my point of view, this re-recording is superior to the original. That isn’t to say I dislike the original, but the increased professionalism, maturity, and vocal development over the years ensured the song is significantly more polished than the original release. It was also the first single released from 50 St. Catherine’s Drive. Mother Of Love is such a peaceful song. Magnificent vocal delivery and pace again proves what an exceptional vocalist Robin was. Anniversary has a simple but appealing acoustic guitar introduction. I may love the distorted sound of an electric guitar, but a well played acoustic is equally as good; albeit different. However, while the song is lovely and Robin's vocals are spot on, there is just something that isn’t quite grabbing my attention with this song. I could quite easily proceed to the next track when this one comes on. Sorry is a song that has a modern pop styling to it. It isn’t bad, but reminds me of another really popular song that I just can’t put my finger on at the moment. If I ever figure it out, I will add an appendix. Cherish has a fantastic beat and flow. Sometimes that is all you need. I absolutely love the vocal delivery on Don’t Cry Alone. Seriously, just take a listen to this track. It is moving and emotional and is nothing short of beautiful. Avalanche is a nice song, but it does feel like filler and lacks a little bit of polish in my opinion. One Way Love unfortunately falls into the same category as Avalanche. The beginning of the song had promise, but again something is missing. Broken Wings has an interesting entrance whereby it is very atmospheric as it builds to the initial verse. It then merges into a dance/disco style song. Not bad at all, just unexpected. Sanctuary brings back that wonderful acoustic guitar. Robin’s vocals really work well in conjunction with the acoustic sound. The overall beat and pace of this track is pleasing, although the sibilance in Robin’s vocals becomes apparent and it is a little distracting. If you don’t know what sibilance is, keep it that way. After researching it and knowing what to listen for, so many good recordings have become a disappointment for me because I now notice it. Solid is a solid song. Yes, I know I went there, but it is genuinely good. Not exceptional, but not quite a B-side filler track either. All We Have Is Now is toe tapping and head bopping heaven. Although, Robin’s vocal delivery sounds as though it is in a lower register than he normally sings. It is different, but very enjoyable. Sydney (Demo) marks the last song that Robin ever recorded. While the album only features a demo of the song, I feel this is the perfect way to close out the album. Given Sydney (Demo) is Robin’s last recording, I hope his estate also considers this to be the last album of previously unreleased material to be released. While we all want more from our favourite artists, the last thing we need is a collection of songs that Robin likely would not have been happy to have released. That said, it's highly likely that he would be very pleased with the release and mastering of this album. As a fan, I know I am. If you’re a Bee Gees fan, then this album is a must own. Frankly, I believe every music lover will find something to appreciate about this album. It is exceptional. While a couple of the tracks are a little less than perfect, this has little to no impact on the album as a whole. 50 St. Catherine’s Drive is available on CD and TIDAL Hi-Fi. Since I was a child, I have been a fan of the Bee Gees. I recall listening to the Bee Gees Greatest and Best Of Bee Gees for countless hours on cassette, pondering why their sound was so unique. I think it’s fair to say that Barry Gibb’s often lead vocals, mixed with Robin Gibb and Maurice Gibb’s vocal harmonies was a match made in heaven. I often wonder how many people purchased a vinyl recording of the Bee Gees and wondered if they had flipped the 45rpm switch on a 33.3rpm record as Barry’s falsetto vocals were incredibly unique, especially on songs like Stayin’ Alive, as the band headed into their newfound 70s sound. Interestingly, I would find when listening to the Bee Gees on cassette, that the natural wow and flutter of tape, along with tape stretching, would seriously compromise the Bee Gees sounds and Barry’s falsetto vocals, more so than other artists. While their music expanded into genres such as rock, pop, R&B, and associated ballads, the Bee Gees will always be known for their fast paced disco sound that arguably marked the most successful years of their career. Certainly the predominantly Bee Gees recorded 1977 soundtrack, Saturday Night Fever, is a testament to this with songs like Stayin’ Alive, Night Fever, More Than A Woman, and You Should Be Dancing. Earlier this year, I was fortunate enough to receive a re-press of the Saturday Night Fever record as gift, but coincidentally when Record Store Day 2015 (RSD15) came around, the Bee Gees released the Extended EP. This unique release included all the before mentioned tracks from Saturday Night Fever, but they were the extended editions of the songs that we all know and love. The EP is presented in a die-cut sleeve with foil stamping that simply looks exquisite. Presented on black vinyl, the 45rpm pressing has a lovey multi-coloured label that is amazingly hypnotic when in motion. Although, as I use the Audio Technica - AT-618 LP Stabiliser, I rarely see the effect in action. Now this is one collection of songs that you will not be able to get via digital delivery methods, such as TIDAL Hi-Fi, Apple Music, or iTunes. These songs, and the Extended EP, are exclusive to this limited edition RSD15 vinyl release, so even a CD release is out of the question. You can of course get the original mixes, on all popular services and formats, but subjectively which ones do I prefer? Stayin’ Alive is expanded by additional horn licks and chorus repeats that add to the vibe of the original song. In this case I prefer the extended mix as the additional, although repeated, aspects only improve an already iconic song. By comparison, I feel that Night Fever is too repetitive and I am always looking for a new sonic element to amplify the song when listening. In this case, the extended edition is great, but I feel it is on par with the original and therefore doesn’t surpass it. More Than A Woman is similarly extended by chorus repetition and isn’t drastically different to the original either. You Should Be Dancing has an additional, and slightly longer, instrumental aspect towards the end of the song that I prefer over the original. It simply makes you want to keep dancing, and when it comes to the Bee Gees, this is a good thing. The most interesting aspect of this comparison was how sonically superior the 45rpm Extended EP was to the digital copies, of the original mixes, on TIDAL Hi-Fi and Apple Music. Now, 45rpm pressed vinyl generally has a sonic improvement over 33.3rpm, and I feel 33.3rpm vinyl is generally smoother and more appealing than the digital counterpart when played on an audiophile-grade turntable. That said, the difference was significant enough for me to be disappointed in the lossless TIDAL Hi-Fi editions. However, they are from different masters and that likely has played a significant role in the tonal differences. Although, my vinyl copy of Saturday Night Fever also sounds much better than the digital counterpart. Yes, these songs were mastered originally for vinyl, but the differences shouldn’t be this significant. This difference is why I truly believe that music lovers should not limit themselves to a single music format, or service, as music rarely sounds the same across all possible formats, despite logic suggesting it should. One of my key goals as a music collector is to source the mastering edition that I subjectively feel delivers the best sound quality. In this case, it is the Extended EP on vinyl, but I concede that a true comparison is difficult as the extended versions are not available on competing platforms. If you're interested, a couple of vinyl editions are still available and I can assure you that you would not be disappointed in the re-issue of Saturday Night Fever. Now let’s put on our boogie shoes, because we should be dancing!